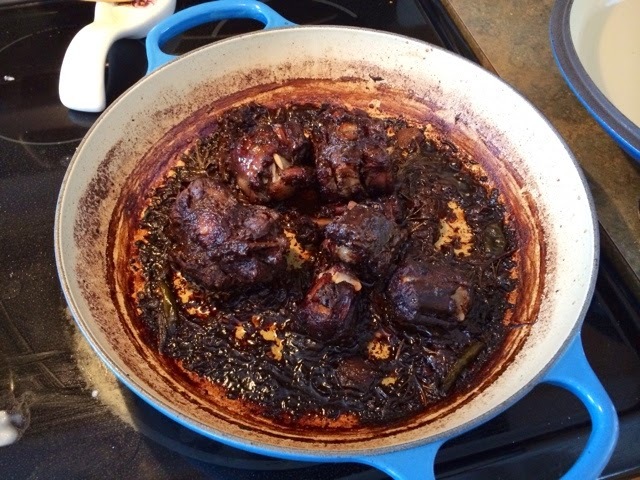 Recently, I bought a cookbook, Ottolenghi, and it had a recipe for oxtail. I only looked at it in passing, probably because I hadn't heard the term oxtail in refererence to food before. Cattle, yes, food, not so much. But I was in the meat section of the grocery store and there it was! Suddenly it clicks in my brain, I've seen a recipe for this! I'm going to buy it and try it out at home. When I get home I open the cookbook and realize the recipe is for oxtail stew. I'm really not into stew at the best of times; I want more of a formal meal. So I go to Pinterest looking for an oxtail recipe. Again, all stew recipes. I'm coming up high and dry again. What am I going to do with this oxtail? Finally, I find this recipe from Cairns Manor. I like the Asian influence in the recipe and figure it will be a good jumping off point. But what to make with it?? I don't want to serve it with something that's going to overpower all those flavours in the oxtail. I need something that can offer a good counter balance to the texture of the meat, so I decided on polenta. But polenta with a little bit of kick, because as those who have made polenta before know, it can be a little bland. 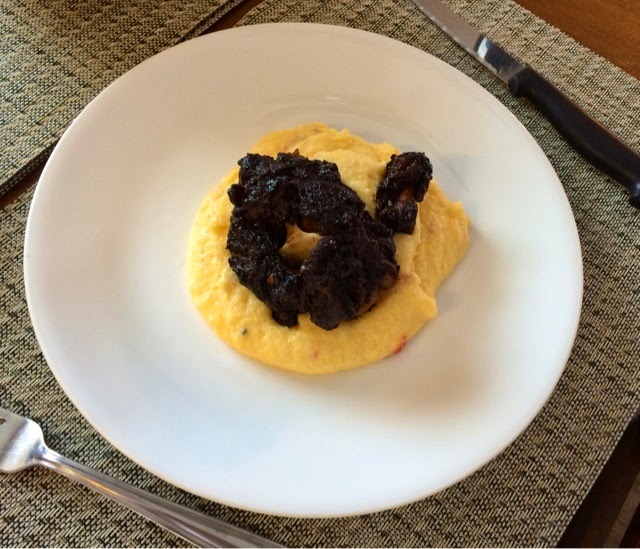 I decided to use this recipe Pimento Polenta recipe from Jezebel as my inspiration, though I changed it up a bit. The end result is the meal below, it might not look great, but it was very tasty. Oxtail is a winner. It is a lovely, heavy meat that I will definately be buying again. Cooking the oxtail takes the longest amount of my time in this recipe. It needs to cook for about 3 hours all toether. What I did was cook it for an hour and a half on one side, then flipped it and cooked it for another 90 minutes on the other side. If you have a braiser or a Dutch Oven these would be the best instrument to use. However, if you have neither, this might be the time to invest in one. I highly recommend a braiser. I love mine, and I have found that since I bought it it's replace most of my pans and pots. Its perfect for browning the meat on top of the stove, then it can go directly into the overn (as can a dutch oven). However, in the meantime if you don't have a braiser, brown the meat in a frying pan, then put it into a cassoulet or casserole dish for the oven. What I really like about this recipe is the Asian flavor due to the use of Chinese 5 Spice Powder, Thai peppers, soy sauce and ginger. Enjoy! Put the 2 tablespoons of olive oil into your Braiser or pan and bring it up to a medium-high heat. Be sure to pepper and salt your oxtail, then put the 2 tablespons of olive oil into the pan to heat up. Brown the meat on all sides. Once your done browning, remove it from the pan and put it onto a plate. Reduce the tempture to low. At this point you should add the 2 cups of broth to a bowl. Then add the 1/3 cup of soy sauce, Chinese five spice powder, cloves, Thai peppers and anise seed. 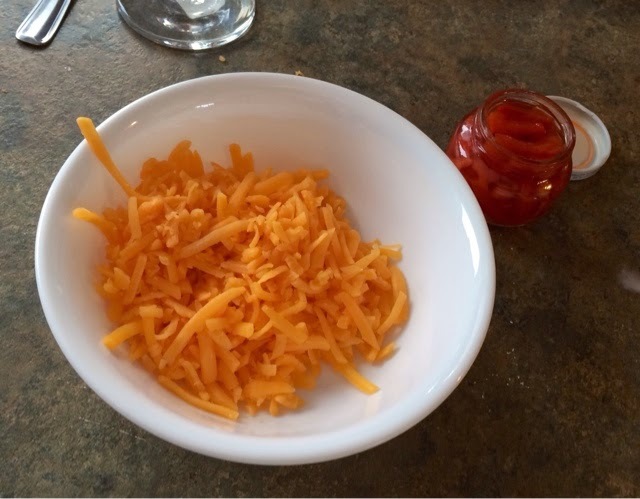 Mix with a spoon. Add the wine to the braiser. Bring it to a boil for a few seconds. It will burn down pretty quickly so make sure you are ready to add the broth mixture. Combine and stir until it is simmering. Add in the Oxtail, cover, and put it in the oven for 90 minutes. At 90 min, uncover. You'll notice the juice will have reduced a lot. Turn the oxtail over and resume cooking for another 90 minutes. About 40 minutes before the oxtail is ready, start on the Pimento Polenta. -Add the salt to the pot, then bring the water to a boil. 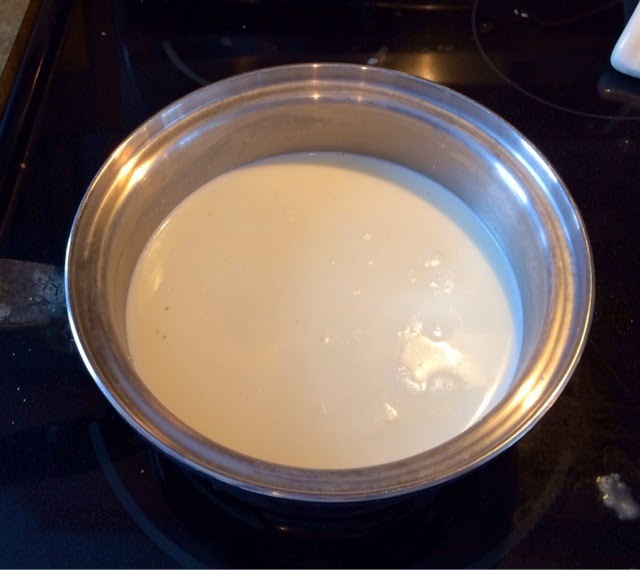 Slowly whisk in the cornmeal and stir vigorously, adding the heavy cream as you go. -Continue to cook the polenta over a medium-low heat, stirring frequently, until it is soft and thick, and the water has been absorbed. About 10 to 15 minutes. If it's too runny, add more cornmeal. -Cover the pan and allow the polenta to sit for 5 minutes. Stir in the butter, the pimentos and cheese, to combine. Serve under the oxtail. Posted by Heidi Schempp Fournier at 10:53 a.m.